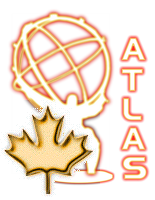 What has Canada contributed to ATLAS? The liquid argon hadronic end-cap calorimeters were designed at TRIUMF, copper plates were machined at U.of Alberta, modules were assembled at TRIUMF, and TRIUMF personnel designed the tooling and oversaw the final construction of the wheels at CERN. The hadronic modules of the liquid argon forward calorimeters were built at the University of Toronto and Carleton University. The cryogenic feedthroughs for the liquid argon calorimeters were designed and built at the University of Victoria in collaboration with TRIUMF. Radiation-hard front-end electronics for the liquid argon calorimeters were designed at the University of Alberta. Studies of radiation damage and activation of silicon for the central tracker and pixel detectors were performed by the group at the Université de Montréal. The University of Toronto and Université de Montréal groups worked on the pixel detector. The groups at McGill, the University of Alberta, the Université de Montréal and the University of Victoria work on the High Level Trigger.